This is interesting because according to Buddhist thought, one’s self is made up of five aspects (“skandhas”, in Sanskrit), and one of these is “samjna”, or “perception”. The Buddhists believe that there are no “five senses”, but just “the senses”, which is composed of all senses combined. They apply this theory to meditation and, in some strands of Buddhism, yoga, but the important thing is that they believe there is no real distinction between senses. Buddhism believes the senses are all interlinked and inseparable. 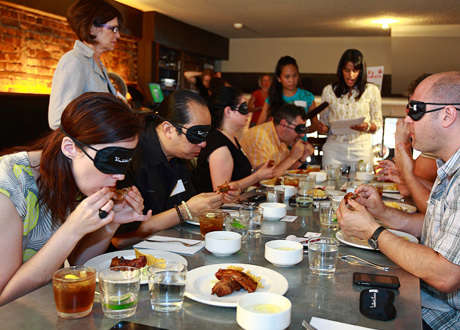 This means that eating blindfolded not only plays a trick on one’s vision to make them feel they’re full by eating less, it confounds the entire sensory system, including taste and smell. If the Buddhists are correct about the sensory system being a single, interconnected entity, this practice of eating blindfolded could really be useful not only in reducing food intake, but also increasing the whole eating experience as well. I think this is a very interesting topic considering how much our country overeats compared to other countries; however, how applicable could this diet actually be to real life? I can’t see myself strolling into the dining hall and blindfolding myself before I eat. I also can’t grasp how you would even find your food with your fork on the plate without looking at it. Maybe you’d eat less out of frustration of not being able to find your food! In all seriousness though, I think it’s cool that you took a movie scene and turned it into a scientific question. I found a lot of sources backing up your hypothesis, including this one in science news. Check it out! I really enjoyed this article because I’ve never heard anything like it. It’s interesting to think about how when you take away something so simple such a big change can occur. I also think it’s interesting how when the sight was taken away, the tastebuds were more sensitive. I always thought the idea of having one less sense would heighten the others was a myth, however I’m mistaken. As I googled, I actually came across this http://www.theblindcafe.com/. It’s a cafe where people play their music in the dark and people are able to focus more on the actual music rather than the other distracting factors. I know this isn’t food, but I thought it was an interesting thing and a way to expand the blog and talk more about the senses. It is interesting how our other senses can play a role in how we feel about the food that we are eating. I read a book over the summer which took a look at why personal preferences were different depending on the person. During one chapter, it looked at how humans react to the foods that they eat. For example, if a subject was blindfolded and told that they were going to eat banana, but were fed nuts instead the subject would rate the food worse than if they were given the actual banana. Also, if subjects were informed about the meal that they were about to eat using appealing adjectives, then on average they would rate the meal better than if they were given a more simple description. McQuaid, John. Tasty: The Art and Science of What We Eat. N.p. : n.p., n.d. Print. I liked this topic, I think the concept of overeating is fascinating because even though eating is a physical activity, a huge part of it is mental. Perhaps you could have dug deeper into confounding variables of overeating? This article (http://www.watercures.org/reasons-we-overeat.html) talks about other psychological reasons people overeat. There’s so much more to it but I think blindfolding is such an interesting way to reduce it. I also would love to know more about why when people inhibit one sense, the other become stronger? Great ideas and topics, but more detail and research would make it even better! This is such a great post. I would have never thought about this! But it is so true..I definitely overeat just because the food was really good or I paid a lot for it and I feel bad wasting it. I think I should try to blindfold myself and eat just to be full. The phrase “eating with your eyes” definitely comes into play here. This Huffington Post article talks about some of the different “ways” one can eat, whether it’s with our eyes, the scent of the food, etc. It’s a good read! I really enjoy this topic but I think your post lacks some crucial insight of the material. You kinda lack a specific direction and just generally explain what happens rather than following up on questioning why our brain does this when we eat? Why does it enhance these tastes? There are many other ways to specify this text. Also, your studies are very general, and although you do give a live link to them, you should explain more in depth about what they entail. You do go on to provide the possible confounding variables that go into how much we eat such as stress, etc, but why are our bodies used to eating when we aren’t hungry? To give more insight to answering this question, this article shows a variety of credible reasons to further investigate. Although, as a starting point it goes ahead and explains a main point of your blog which is how to solve the problem of over-eating. The author, Dr. Sherry Pagoto, explains methods and examples for how to train the mind based on individual needs and preferences to be a healthy, normal eater. I am a “live to eat” kind of girl, so I found this extremely interesting. My mom actually did a little experiment on my family relating to portion size a little while back… she observed whether my dad, brother, and I ate a smaller portion when she didn’t place the food on the table. It proved true for the same reason that you discussed: if the food is in front of you, you’re more inclined to eat it because simply because it’s there. This article (http://www.health.com/health/gallery/0,,20769037,00.html#start-with-a-glass-of-h2o–0) also discusses other tips that you can do to reduce your portions, some I do without being aware of! For instance, drinking a lot of water throughout the day and before meals to feel more full, and focusing more on conversation in order to encourage myself to eat slower. This is a really interesting concept that I had never given any thought to prior to this post. With more than two thirds of Americans classified as overweight or obese, it is imperative that we begin to consider creative techniques to bring those numbers under control. This blindfold idea is a good start. It reminds me of the recent realization that the size of ones plate can affect his or her perception of portion size and how much food he or she is really eating. It is possible that food psychology can be a force for change with regards to our nation’s weight problem. Is it possible that the blindfold idea is not so much about out perception of hunger but more about human desire to complete tasks? That might be an interesting area to explore.